The ArGo is small enough to fit in your palm. Pocket-sized and inconspicuous, it also comes with pre-loadable stems. Its batteries can be removed and interchanged, and the push top is glass protected. You couldn’t be more prepared for an outside vaping session if you tried. ArGo’s batteries truly live up to the quality of the product. They’re high capacity, rechargeable batteries that can handle USB charging. In fact, you can even vape with the ArGo while you’re charging it! With the ArGo screen interface, you can customize your sessions just the way you want to. After you’ve done that, you won’t have to wait long to start your session. This is because of how quickly the ArGo heats up. Once your session has begun, you’ll notice an incredible amount of flavor, and this is mostly because of ArGo’s all-glass vapor path. This allows for an isolated air path, resulting in the pure and thick clouds that everyone’s talking about. Is ArGo The Best In Its Class? 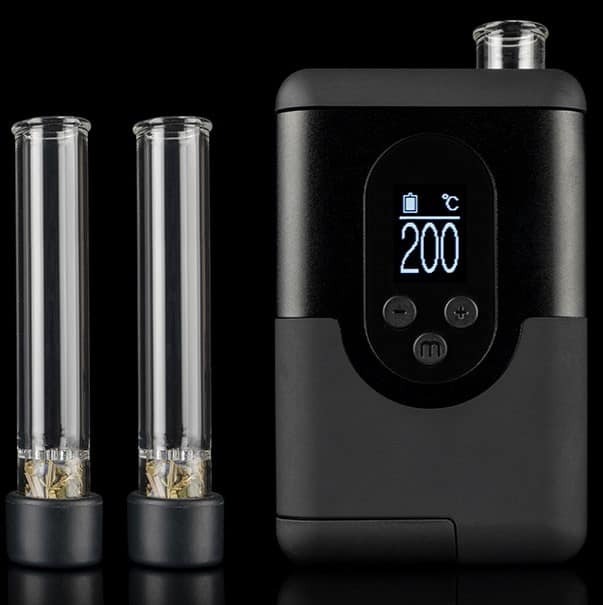 Arizer assures us that their components are of the highest quality, and that no other competitors can match the performance and convenience of the ArGo. But is this true? To find out, we looked at what everyone is saying about ArGo. We looked at 13 reviews on ArGo’s page, as well as a blog review of the product, and then compiled the most important takeaways from customers’ experiences. What Are People Saying About The Arizer ArGo? People also remarked that this product is discreet. Seeing how small the ArGo is, this goes without saying. It was mentioned that this product needed very little cleaning even with daily use. It averages 90 minutes on a full charge, which is great for a device this size, but it takes about 3.5 hours to fully charge it from dead. He recommended picking up a couple extra batteries and an external charger. Produces some warmer temperatures because of the shorter vapor path, but extended stems are available as well. The temperature isn’t all that bad though. However, his conclusion and ours is that these minor cons don’t outweigh how awesome this device is. With ArGo, you’ll get everything you need in a small pocketable device. One other con might be the price, which one person said is more expensive than other products on the market, but then he followed it up with “but you get what you pay for.” Indeed. ArGo provides a complete experience that’s perfect for most vapers out there, especially those who are on the go a lot. ← The Volcano Vaporizer on Amazon?